Animals are armed with an array of weapons for use when hunting for prey or defending themselves or their brood when under attack. In addition to keen vision, claws, teeth, horns, tough exteriors, webs, and fleetness of foot or fin, some vertebrates and invertebrates have chemical weapons that they deploy offensively or defensively to combat potential predators. These chemicals are venoms, which are toxic substances directly introduced into the victim’s bloodstream (envenoming) by bite, sting, or insertion of a spine or other sharp part. Among vertebrates, the best known and studied venomous animals are snakes. The first genes for venom may have evolved from lizards, the closest relative of snakes. Of the 3,000 snake species, about 600 are venomous. Snakes use their venom to protect themselves or to directly kill or immobilize their prey. A poison gland containing venom is located in the back of the head; it is connected by a duct to a hollow fang. In addition to toxic chemicals, the venom also contains saliva, the digestive juice common to most land vertebrates. Venoms may contain twenty or more ingredients, the principal ones being neurotoxins and hemotoxins, with some venoms containing a mixture. The protein nature of venoms was first discovered in 1843 by Charles Lucien Bonaparte, nephew of Napoleon. Neurotoxins, contained in the venom of cobras and coral snakes, affect nerves and muscles and cause paralysis at the nerve-muscle junction; death results from heart or respiratory failure. Although legend has it that Cleopatra committed suicide after sustaining the bite of an asp (Egyptian cobra), recent scholarship points to death after ingestion of a poisonous mixture. 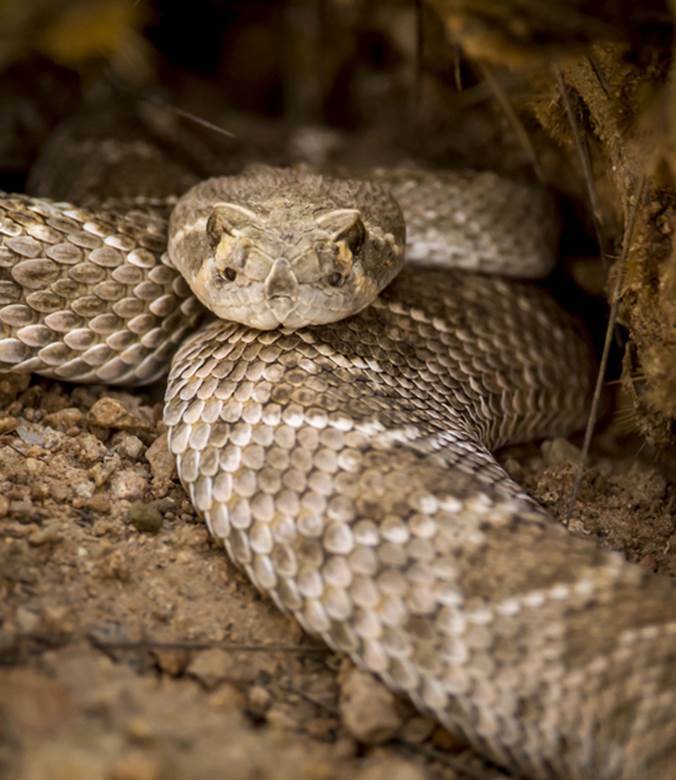 Hemotoxins, used effectively by rattlesnakes and other pit vipers, prevent blood clot formation or precipitate breakdown of existing clots, causing extensive blood loss and ensuing shock that disables the victim and its escape. Other hemotoxins cause almost immediate clotting, resulting in stroke and heart attack. Chemicals extracted from snake venoms have been used medically to treat hypertension, stroke, and heart attack, and are being evaluated for relief of severe pain and the treatment of melanoma, diabetes, Alzheimer’s, and Parkinson’s. SEE ALSO: Medulla: The Vital Brain (c. 530 Million BCE), Nervous System Communication (1791), Blood Clotting (1905). The Eastern diamondback rattlesnake (Crotalus adamanteus) is the most dangerous venomous snake in North America, with human mortality rates after being bitten ranging from 10 to 30 percent. Its venom has proteolytic and hemotoxic properties—i.e., it damages tissues and destroys red blood cells—while promoting uncontrolled bleeding.